Dragon Metrics allow our users to conduct keyword research right inside our app interface, to access our keyword research section, simply go to the Keyword Research page under Keyword section. For Bing and Baidu, we get the data directly from the search engines. 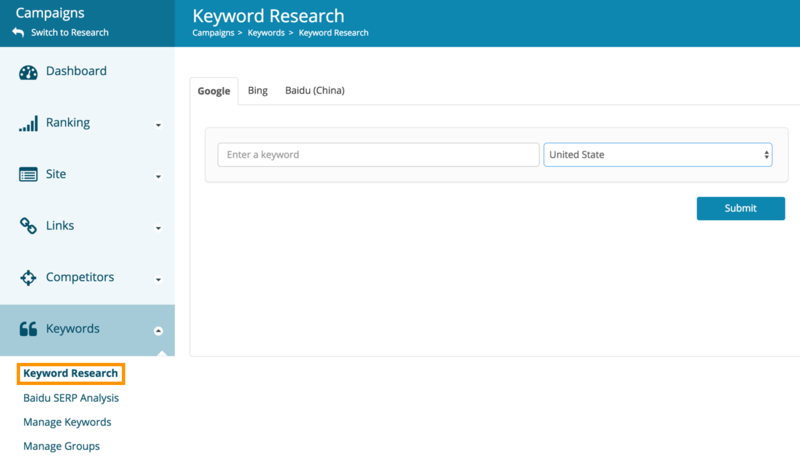 So we have keyword data for all keywords in existence. For Google, unfortunately, our keyword research data is a bit more limited. (This is the only aspect that’s limited. Rankings, links, competitors, analytics, etc. are unaffected). It’s a bit more limited because a few years ago, Google cut off direct access (http://www.kahenadigital.com/google-revokes-adwords-api-access-for-seo-tools/) to the Adword Keyword Planner API to almost all SEO tools. Because of this, we’ve all had to find other ways to get the data. We now have access to a database of 90 milllion keywords, which is a lot, but still not nearly enough. This data does come from Google, and is refreshed monthly, but only contains 90 million. Furthermore, the vast majority of these keywords data is for United States – English. Google offers their Adwords Keyword Planner (https://adwords.google.com/KeywordPlanner) as a free and publicly open tool. It has the most accurate and freshest data (it’s a tool from Google) available, and provides the best related keyword suggestions. To be honest, no other free or paid tool is nearly as good as their suggestion engine. In Dragon Metrics, we offer our keyword research of 90 million keywords to our users, as it’s still a very nice feature to have. But while we work towards finding a more long-term solution, we suggest our users utilize this tool on Google’s site, and import the data into Dragon Metrics. It’s an extra step, but it still works quite well.